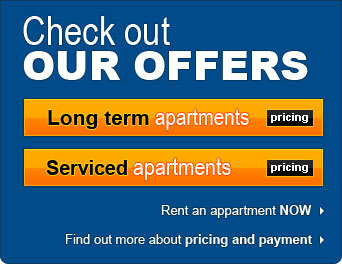 Why should you choose an apartment instead of a hotel ? Some would say that it's not such a hard question after all, if you are willing to balance very well all the pro's and the con's associated with it. Or is it ? Well, depending of what you have as an objective when you travel to Bucharest, both a hotel and a serviced apartment would be the right answer. If you stay for short term, you might prefer the hotel for it's glamour and for its "all inclusive" policy. Also you might prefer a certain hotel brand for the reliability it guarantees, although this might not always be the case. However, once the first few days pass away, you discover that the bills for dry cleaning and restaurant meals pile up and the space from the little hotel room is not so generous, especially if you plan to bring your friends over. This is where you start thinking that the serviced apartment ideea might work better, if you plan to have a financially well-balanced journey in Romania. Actually, a lot of our clients for serviced apartments in Bucharest discover that, once they try our rental properties, they wouldn't want to use a hotel again, even if they stay for 1 or 2 nights. It just doesn't make sense anymore. Why would you pay up-to 60% more for a hotel room with half the space, when you have a generous one or two-bedroom apartment which has the same quality or better ? On top of that, you get a full kitchen, a washer and dryer, instead of continually use the expensive dry-cleaning service for your clothes. If you calculate, a top executive one-bedroom serviced apartment in Bucharest provided by Corporate Apartments Bucharest costs 65 EUR, compared to a 150 EUR luxury apartment in a top Bucharest hotel. You get the same quality inside the apartment or even better; the position and the entrance of the building where the apartment is located might not be so glamorous as a hotel lobby, but for a discount of more than 70 percent, you will find this becoming suddenly unimportant.